Fashion enthusiasts can now get their favourite luxury watches right at their doorstep. Daraz.pkhas announced a partnership with Michael Kors, Burberry and Armaniwhich will see these popular international luxury brands distribute in Pakistan through the online shopping website. Launching on Daraz.pk, this will be the first time these brands will have an exclusive brand page for customers to purchase their favoriteluxury watches online in Pakistan. The addition of Burberry, Armani and Michael Kors comes as Daraz.pk continues to build on its already extensive offering of international fashion and electronics brands, alongside its eclectic assortment of local labels. Other luxury brands to come on board are Rado, Raymond Weil, DKNY, Diesel, Fossil andMarc Jacobs. Daraz.pk’s firm foothold in Pakistan’s ecommerce sector, with over 1.7 million visitors each month, means that these brands will launch to an already greatly established customer base who are looking to make purchases online.Pakistani men and women are some of the most stylish and well-traveled people in the world and with the helpof iconic luxury brands such as these, Daraz.pk wants to cater to their needs and offer them a glamourous and sophisticated shopping experience. 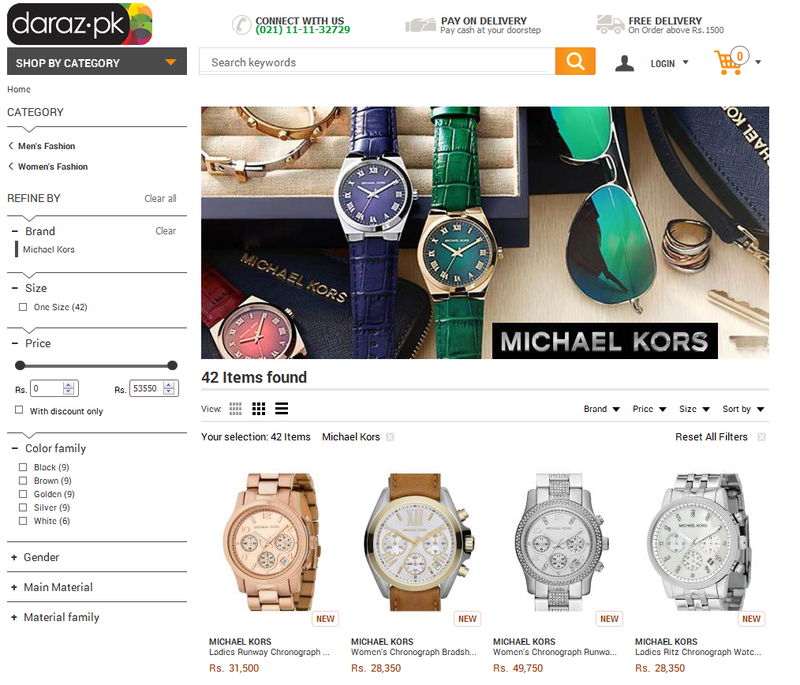 “Daraz.pk is the leading ecommerce portal in the country and having such well-loved and aspirational luxury brands such as Michael Kors, Armani, Burberry, DKNY etc. come on board is great indication of how traditional retailers can partner with ecommerce websites to introduce their brand into new developing markets and enhance consumer experience by fusing online and offline retail,” said Farees Shah, cofounder Daraz.pk. With a keen eye on the latest fashion trends, Daraz.pk offers a wide assortment of fashion and lifestyle brands. Each international luxury brand will have its own shop-in-shop on Daraz.pk. With Daraz.pk’sefficient delivery, free returns and multiple payment method, customers will be able to get their desired luxury timepieces whenever, wherever. Incorporated in 2012, Daraz.pk is an online shopping portal featuring apparel, accessories, shoes and beauty products for both men and women, as well as a wide variety of electronics and general merchandise. Daraz.pk currently offers hosts 1.7 million visitors on its website, every month. Headquartered in Karachi, it has delivered both internationally, as well as to over 200 cities in Pakistan. Daraz.pk is part of the Asia Pacific Internet Group (APIG) which supports some of the leading internet companies in the region. Founded by Rocket Internet in 2014, the APIG’s mission is to promote innovation and entrepreneurship throughout Asia and the Pacific and to support the development of a vibrant online culture. APIG’s network currently consists of 10 companies, which are operating in 15 countries.